I’m excited to let you know that, for the next 12 months, I’ll be based in Washington D.C., from where I’ll be exploring opportunities for the Arts Catalyst in the US, as well as – after 21 years leading the organisation – taking a semi-sabbatical to extend my own research and writing. One exciting initiative that I’m involved in is as a member of the Steering Committee for the US National Academies’ Keck Futures Initiative ‘Art and Science, Engineering and Medicine Frontier Collaborations: Ideation, Translation & Realization’. The conference at the heart of this initiative takes place next week in Irvine, California, and brings together a diverse group of participants (selected from an open international call) to explore how arts, design, sciences, engineering and medicine can stimulate a renaissance of innovation to solve real-world problems, and create concrete projects that can lead to educational, cultural, social and scientific impacts. As a steering committee member, I’ll be mentoring a couple of the ‘seed idea’ groups that I’ve been involved in putting together: Developing Programs to Engage and Empower Communities to Address Threats to Ecosystems, and Creating Open Data Culture. Another couple of conferences I’ll be participating in during the year are Aerosolar: Space Without Rockets at the Rubin Center for the Visual Arts in El Paso, Texas, this week, curated by my former colleague Rob La Frenais, where I’ll be talking about the peaceful uses of outer space and attending an experimental balloon launch by artist Tomas Saraceno at White Sands, and the Association of American Geographers (AAG)’s annual meeting in San Francisco, on a panel about Geographies of Outer Space, convened by Julie Klinger and Dan Bednar of Western University in Canada, in March 2016. Also on the space-related side of my work, I’m eagerly awaiting the publication of a book to which I’ve contributed a chapter, The Palgrave Handbook of Society, Culture and Outer Space, a vital collection of texts from a broad range of disciplines that examine outer space as a dynamic and contested field, edited by Peter Dickens and James S. Ormrod. Whilst on the pricey side for most of us, I’m sure many institutions will order a copy for their libraries and I’ll ensure that the Arts Catalyst has a copy in its reference library. We’re also thinking about holding a seminar or event in London next year to explore and open up some of the book’s key themes and ideas. During the coming year, I’ll continue to oversee the Arts Catalyst’s artistic programme whilst handing over most executive leadership to an interim Managing Director. I’m therefore delighted to announce that we’ve appointed Gary Sangster as Arts Catalyst’s Interim Managing Director. Gary has an exceptional international track record as a museum director, curator, educator and writer, and brings his vast wealth of knowledge and experience to the company. This all comes at a very exciting time for Arts Catalyst. Following our highly successful crowdfunding campaign, the Arts Catalyst’s new Centre for Art, Science and Technology opens in Cromer Street, King’s Cross in January 2016 (I’ll be back in the UK for the opening). Our opening project at the centre will be ‘Notes From the Field: Commoning Practices in Art and Science’ – details upcoming. You can follow my work both in the USA and the UK (and anywhere else I get invited to!) via this blog and my twitter. * Image: Neal White and Tina O’Connell’s 1×1, as part of 5×5, comprised 1,000 small vials of “tears” – water collected in Japan after the earthquake and Fukushima Daichi nuclear power plant disaster (my small role in this project was in facilitating the collection of the water from Japan). 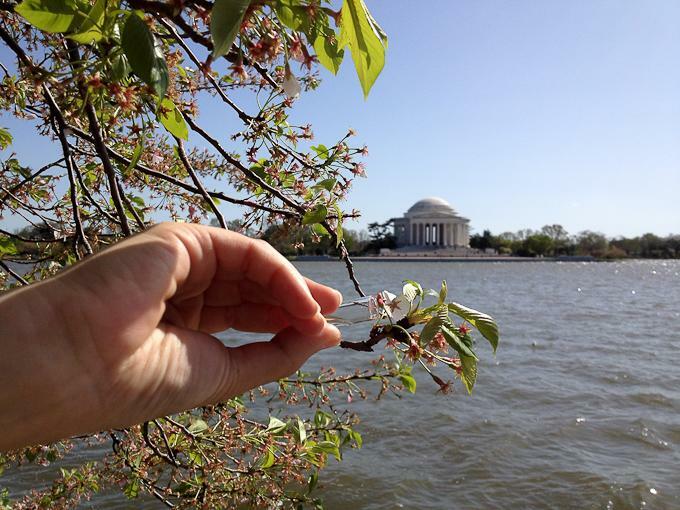 Visitors were encouraged to pour the water on a cherry tree bringing about a symbolic rebirth, drawing on the specific historical connection to the gift of the Cherry Trees to Washington DC one hundred years ago. 1×1 reflected upon the range of experience and responses to the Tsunami and Fukushima Diaichi catastrophe in Japan a year before the project.